Hello, I am Mike Alexander. I was first licensed as as a Novice KAØGMO in 1979 while in junior high school. The next year after my Morse code speed increased, I passed my General exam and received the call NØBXE. I have not yet wanted to upgrade for a little more spectrum, so I think I'll keep this call till I die. After graduating High School I joined the United States Air Force. I was a technician responsible for high power microwave telecommunications systems and equipment repair, installation, and maintenance. After leaving the Air Force, I started working in the 2way and paging industry. I engineered, built, and maintained communications equipment and sites. 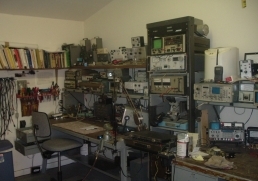 I passed my FCC General Radio Telephone Operators license and continued working in this field for sixteen years. I started fixing Ham radios on the side for Jess Miley KØTAA back in 1998 and I have had over a thousand radios through my shop, all from word of mouth!! My wife's current medical conditions require me to work from home and take care of her so I am trying to expand my repair business to pay the bills. Any work you send my way is greatly appreciated! !